On Thursday, Facebook announced the global launch of its Trusted Contacts password recovery feature. With this service, users can designate between three to five friends who can be contacted if there are any problems accessing the user’s account. It’s an enhanced security measure designed to make it more difficult for hackers and those with malicious intent to take over someone’s Facebook account. Originally launched back in 2011 as Trusted Friends, the social networking company has since rebranded it as Trusted Contacts. In doing so, Facebook has also redesigned and made some updates to improve its offering. 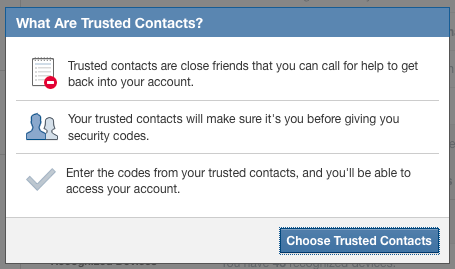 Besides giving users more control over their account’s security, Trusted Contacts allows friends to be chosen and managed anytime from Security Settings — it does not have to happen when there’s trouble accessing an account. Another update that’s been made is the release of more information to a user’s contacts so that they can better help when needed. Facebook defines a Trusted Contact as a close friend who users would feel comfortable reaching out to when they’re having difficulties with their account. It could be a parent, sibling, significant other, relative, best friend, or, as Facebook describes it, the person that would be entrusted with a spare key to a house. Other criteria the company recommends users choose friends under include those that can be reached without using Facebook because if you’re unable to log into your account, how will you contact someone using the service? Facebook recommends that ideally users choose someone who can be reached over the phone or in person. Also, it’s suggested that more people be chosen (there is a limit of five contacts) so that way, if one person is unavailable, there are alternates that can help. Once a friend has been assigned to be a Trusted Contact, Facebook will reach out to him or her and let them know so they aren’t caught off-guard. The release of this security feature comes as the rate of cyber attacks have become more prominent this year, perhaps most notably on Twitter. And no one is immune to these situations — in February, Facebook employees found themselves victims when their computers were infected through a Java vulnerability that installed malware on their computers. And it doesn’t need to be a cyber attack in the sense that there’s a phishing scam. Rather, it could be through a security hole, like what happened with Facebook’s iOS app in April 2012. Facebook says that by utilizing Trusted Contacts, users won’t necessarily need to worry about remembering the answer to the standard security question protocol — something people probably haven’t thought about providing secure answers for. Of course, if you suspect your account has been hacked or compromised in any way, Facebook wants you to let them know.